Over the past two decades, the need to shift from one place to another has rapidly increased. Be it for some personal reasons to opting for better job opportunities, higher studies etc, home shifting and relocation have become very common in India. Long gone are those days where our ancestors lived in the same city and same home from birth to death. Now, with change in time and scenario, most individuals have started moving out to get better opportunity. They have welcomed the new change and has learned to adapt to it. Now, with increasing cases of home shifting and relocation, the demand for the cheap and best packers and movers has increased surprisingly. However, finding a good shifting and relocation service provider in India is not that easy. If you are planning for household shifting in Delhi, Mumbai, Bangalore, Kolkata, Pune, Hyderabad, Ahmedabad or any other city for that matter, and you are unsure about how to find the cheap yet best packers and movers then read on. 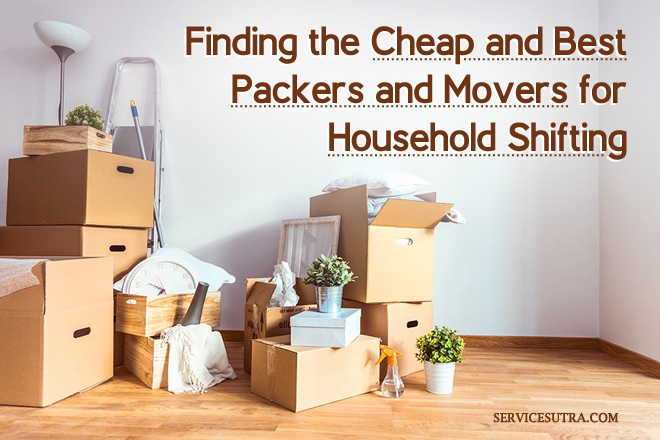 Today in this post I’m sharing with you the list of 11 essential tips on how to find the cheap and best packers and movers for household shifting in India. It takes a lot of effort to setup a house; Right from buying the buckets for your washroom to purchasing all the essential home and kitchen appliances, furniture and kitchen utensils, it’s not an easy task and it takes years. Naturally relocating to a different city or within same city in a different home is not going to be easy. End to end home shifting is a big complicated process and you need professional help to get it right. You have to sort from the existing items which you want to carry and then buy good packing materials to pack them. After completing with the packing, you have to arrange for the transport and then on the final day of journey, you need to arrange a truck and labour to load everything and get it transported. Then, after reaching your new destination, you have to unload, unpack and rearrange everything in your new home. Complicated isn’t it? The process is quite hectic. But you can hire a professional packers and movers service provider to help you through the process. Naturally, there are plenty of them in your city, but not everyone will suit your needs because after all it’s a service that they offer and rates for services are usually not fixed. So finding the cheap and best packers and movers may be a bit tricky, but that’s possible with a bit of planning and effort. Doing it yourself is usually not that easy and you will hardly save much because you have to procure packing supplies, hire truck, labour and insurance and being a novice, you may even end up paying more, kill time and go through all these hassles. Naturally, that’s not the ideal way to relocate, for most of us. However, if you consider the majority of the population, most individuals do not have the time to invest so much in planning and executing the entire home shifting process. Others are not that competent to take so much of load, so the best option for majority of us is to hire a good cheap yet best packers and movers to relocate without hassles. However, hiring just any packer and mover will not do because your entire home shifting process will depend on the efficiency of the packers and movers whom you hire. So, hiring a good experienced and professional service provider is seriously important. Now, the more the experience of the company, the more will be your expenses. So, you basically have to prioritize between your budget and the level of efficiency you expect from the packer and mover company. However, if you take my advice, you have to find the balance between the costs and efficiency of the professional. And if you have a decent budget, you can easily hire the best in trade professionals. I have relocated my house several times and I have also worked with a number of packers and movers companies. I know the industry inside out and hence i can help you find the balance. There are some tips which I personally follow while hiring packers and movers. These are great if you want to find cheap and best packers and movers for household shifting across any city in India. All it needs is advance and smart planning and proper selection on your part. I will share some easy steps with you. Keep reading to know more and relocate your goods with the help of best professionals and at the right price. Hiring a good packer and mover is certainly the most important step in home shifting. If you can find the best pro at the right price, more than half of the battle is won. But, most individuals find it confusing, because they have plenty of options and choosing the best can easily be confusing. So, here are the 11 tips on how to find the cheap and best packers and movers for household shifting anywhere in India. Prior planning is certainly the most important step to find the cheap and best packers and movers for household shifting. Because you need some time to plan everything properly. You cannot simply hurry in this with emergencies being the only exception. Planning at the last moment can be dangerous and you may end up in a mess. It puts you in lot of pressure as you got less time in hand and so the more you panic, the more you will mess up things. Advance planning involves many things. However, the most important and basicones are searching for a new home, deciding your probable date of journey, selecting how many items you want to carry etc. These are really mandatory to decide before you contact the packers and movers as these are the basic information that they need in order to tell their quotations properly. Moreover, if you delay your planning process, you will have to hire the packers and movers at the last moment, which will restrict your choosing options. In high probability, most of the cheap and best packers and movers will already be booked and you will be left with the less desirable companies. The time or to be more specific the season of shifting is very important if you are looking to find the cheap and best packers and movers for home shifting. See, the demand of the packers and movers is high in the pick season that is mainly in the warmer months. Naturally, the rates are also high and the availability of the packers and movers is also very uncertain. So, in order to find the cheap and best packers and movers for household shifting, you may choose the off seasons like the winters or the rainy seasons (in case you do not have an emergency). This is because, the demand is low and so you have every possibility to get good service providers at decent rates. Also, there is flexibility about the date of journey. In other words, you can choose the date of journey as per your wish as the companies are free most of the days during the off seasons. However, the rainy season and winter does pose problems for home shifting in many parts but if you are determined to get it done during off season, you may refer to my home shifting tips during rainy and winter seasons, that will help you execute things better. Budget fixing forms a part of the advance planning but given its importance, I prefer talking about it in a separate point. Proper budgeting is important. You have to fix a budget before you think of hiring packers and movers. See, as a friend, I understand that not all of you have got the same financial stability. So, it is better to cut off your unnecessary expenses well in advance and start saving for your home shifting. Planning and executing the whole shifting process all by yourself will save much of your amount, but if you think practically, the whole shifting process is strenuous and it is advisable to always depend on the professionals for this. If you want to hire a good and efficient packer and mover, you have to have a decent budget as the lower your budget goes, the lower will be the efficiency of the service provider that you will be able to hire. It is not wise to hire a service provider without a good background survey. Firstly, you should talk to your trusted friends, relatives or neighbours for their guidance in case they got prior home shifting experience. If they refer you any name, then you may consider that packer and mover first provided that their services have satisfied the one who is referring you its name. However, if you are not that lucky to get such reference, then you must start your own research. Invest a part of your time in valuable net surfing and try to get as much information as possible. But, net surfing does not mean that you have to find packers and movers directly from Google. You can jolly well find a good platform to get in touch with the cheap and best packers and movers for household shifting. Come, lets discuss this in details in the following point. As I was telling in my previous point that it is always preferable that you searchfor a trusted platform to get connected with the best service providers at affordable prices. The reason I said you this is that there are lots of packers and movers all over India. So, it is difficult as well as time consuming to find out who the best packer and mover is. You literally have to search every profile, compare feedbacks and prices and then decide. Moreover, sometimes, the online reviews are fake, creating lots of trust issues as well. So, better to find a good platform to hire the companies. If you want my suggestion, you can contact the team of ServiceSutra to hire good packers and movers and enjoy a hassle-free home shifting across any city in India. ServiceSutra over the past few years has earned its own respect and trust of lakhs of its satisfied customers. The team with sheer hard work and dedication has onboarded several packers and movers from most parts of India after checking relevant documents. Services are available across more than 250 cities in India. You simply have to create a request for free estimates by filling up the quote request form or by directly calling their helpline number 07044123404. Discuss the basic requirements and you will be connected to the cheap yet best packers and movers who happen to service your city. Also, note that the requesting shifting estimate on ServiceSutra is completely free. Servicesutra helps you get free quotations from up to three different service providers. Final decision to hire and work with any of the movers and packers is still up to you. So why not take our services to find the cheap and best packers and movers for household shifting. You have to select the best company and so you have to be very professional yourself. ServiceSutra will provide with the option of 2-3 top packers and movers of your location but it is upon you to pick the right and the best one for you. So, you must talk to each of the companies in details, know their quotations well and then decide who to choose. Never come to any conclusion by not talking to all of them. Although, we the team of ServiceSutra guide you with the most favourable options of service providers, we also give you the liberty to do some background study on each one of them. You can rest assure that they are all licensed but you can still see some online reviews and feedbacks before you take the decision. Before selecting the packers and movers, it is important that you talk to them in person. In other words, most of the packers and movers which you find from ServiceSutra give you the option for free pre-survey. This service is free and hence you must take this opportunity to schedule a date where the company members will directly visit your home for physical inspection. Face to face conversation is always better and with it, you can get accurate estimates of the amount you have to spend in the shifting and relocation process. It actually helps you avoid any confusion moving forward. You will also get the opportunity to directly solve your queries and know the movers in person. You may not have any idea of the costs involved in home shifting, especially if you are relocating for the first time. But when you speak with two or three different service providers, you get the fair idea of the process and costs. Now, each packer and mover has their own standards and quality and hence their prices are bound to vary. But if you are good at negotiating, you can easily bargain the best deal. For that to happen, you have to do good research and keep yourself updated regarding the basic market rates. You have to have a fair knowledge regarding the standard rates that most good packers and movers ask for. If you know all these details, you will have the confidence which will definitely alert the service providing company and they will surely not think of fooling you. The way you speak and the knowledge you have is important and if you have these, you can become a smart bidder. Learn to negotiate, compare the quotations well and then choose the most suitable packer and mover. I understand that you may have a budget restraint and so may be in search for the packers and movers who have cheap rates. But let me advise you one thing that, opting for companies that offer you too cheap rates may be risky. Now, I already have given you a hint while talking about budget fixing that you need to arrange for a decent sum in order to hire trusted and efficient packers and movers. That does not mean that you have to spend huge but if you want a certain standard service then you have to pay a decent amount. See, at the end of the day, you will want a hassle-free home shifting and for that the potentiality and the experience of the packers and movers matter. But, if you go for too cheap rates offered by any company, they may not be able to offer you that service that you desire. Moreover, the efficient companies are highly experienced and they are updated with the latest techniques to provide maximum security to your goods but with the cheaper ones, they may not have so much safety precautions. Also, opting for too low quotations may end you up in the hands of any fraud company who may try to lure you with such less rates. Therefore, be careful while choosing and make smart choices. The packers and movers that ServiceSutra connects you with are certainly the best in the market with most of them offering you the option for insuring your goods. Now, this is a very important step and you must do this. You never know what accident can occur while travelling and if does happen; you will be at a huge loss. So, it is better to take precautions early than to be sorry later. Insure your goods, so that you will be able to incur better in case of any accidental losses. Movers and packers companies offer various types of insurance options. The movers may charge from 1.5% to 3% of the declared worth of good, depending on the type of insurance coverage you need. Home shifting is quite a difficult thing which is why most people opt for the best packers and movers. However, choosing a right one is important and so you must be really careful in it. So, if you are wondering how to find the cheap and best packers and movers for household shifting, then you can surely consider my tips to get a good idea. Firstly, do prior planning andgood research before hiring any company. Now, since, there are so many service providers which may confuse you, you may use a good platform like ServiceSutra to get connected with the most trusted and efficient packers and movers from almost every part of India. Here, the services are free and you will be able to select from the top 2-3 companies of your location which, in turn will make your work far easier. However, as per as the selection goes, the choice is entirely yours. You must consult each of them regarding your basic requirements, compare their rates thoroughly and then decide. Also, opt for the pre-survey option and avoid taking decisions over phone to be doubly sure on your decision. Also, try to keep a decent budget so that you can get potential service providers with high level security precautions. And, at the end try to be a smart bidder and never forget to opt for the insurance your goods. I have discussed 11 tips on how to find the cheap and best packers and movers for household shifting. I hope you follow these and benefit from them. You can also share your feedback and suggestions on it. And, if you found the tips useful, then please, like, comment and share my post with others. Good post, I enjoyed it so much.I was pretty lucky to find your site. There’s so much useful information! Wonderful site, how do u get all this information?I’ve read through a couple of articles on your website and I like your style. Thanks a million, keep up the good work.